Photograph shows a Claughton in plain black with LNWR number plate, so could have been taken any time from late 1914 to mid 1920s, but is most likely post war. 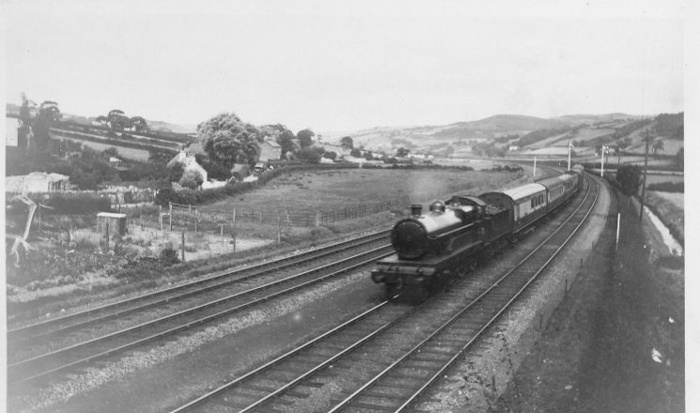 Can anyone tell us the location and details of the train? And even perhaps the date and engine number? photo taken from conway road overbridge looking east along the first and best "North Wales Expressway "!! towards Mochdre, sadly now reduced to two tracks by the interferance of the new expressway its a Claughton its black and it looks superb , does not appear to have a name . An addional photo from Ted showing 'One of Mr Webb�s wonderful Jumbos with a long train at the same location when it was only two tracks.' Click on the image above to see this new photo. Another photo from Ted showing sidings on the right - 'Details on the back state that the date is 21st August 1945 and that the train is �entering Llandudno Junction�. The photo seems to have been published in a book, as also written on it is �Plate 155� and �H. T. 1620�, which might be �H, Gordon Tidey�. The engine is LMS No. 25304 Greyhound, originally LNWR No. 302, built 7.05 and converted to �George the Fifth� type �Superheated Precursor� in July 1922. It has Stanier cast one-piece chimney, LMS buffers, pop safety valves and cut-back cab roof. The tender is the final Bowen Cook type with square oval cut outs in the frames. Click on the image above to see this new photo.